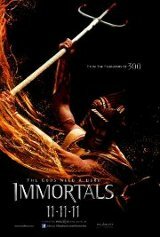 Eons after the Gods won their mythic struggle against the Titans, a new evil threatens the land. Mad with power, King Hyperion has declared war against humanity. Amassing a bloodthirsty army of soldiers disfigured by his own hand, Hyperion has scorched Greece in search of the legendary Epirus Bow, a weapon of unimaginable power forged in the heavens by Ares. Only he who possesses this bow can unleash the Titans, who have been imprisoned deep within the walls of Mount Tartaros since the dawn of time and thirst for revenge. In the king's hands, the bow would rain destruction upon mankind and annihilate the Gods. But ancient law dictates the Gods must not intervene in man's conflict.